In 1984, the U.S. Environmental Protection Agency (EPA) named a hazardous waste site in the state of Louisiana to the National Priority List (NPL). It was estimated at the time that the site held approximately eight million cubic feet of contaminated materials. A computer model was constructed for the site that would simulate the contaminant movement in the subsurface. Modeling efforts resulted in a successful negotiation with the EPA for monitored natural attenuation as the accepted remediation alternative. (“Natural attenuation” refers to the reduction, weakening, and eventual elimination of toxic substances in the soil and groundwater by nature’s own processes.) This EPA determination was a milestone for the site. Previously a pump-and-treat system, which was based on an initial groundwater model developed to simulate hydraulic containment, had cost millions of dollars to install, operate, and maintain. A carbon absorption system was used to treat the contaminated water recovered. By July 1998, over 170 wells were operational. As research continued at this site (and others throughout the United States), the degradation process became better understood. Reductive dechlorination is a biological process that is used to describe certain types of biodegradation of chlorinated solvents in groundwater. For example, tetrachloroethene (PCE), trichloroethene (TCE), and other chlorinated aliphatic hydrocarbons in groundwater, can be biodegraded by naturally occurring anaerobic bacteria (i.e., bacteria that are able to live without oxygen), most commonly of the genera dehalococcoides through a sequential degradation process. PCE degrades to TCE, TCE to dichloroethene (DCE), DCE to vinyl chloride (VC), and VC to ethene. This biodegradation occurs when anaerobic bacteria present in the contaminated site take electrons from organic compounds (called “electron donors”) and produce H2. The dechlorinating bacteria use the electron in the H2 to replace a chlorine atom. Scientists wanted to substantiate these degradation processes, as well as develop rate constants for the reactive transport model (a computer model to simulate the transport of chemical compounds in groundwater, including the degradation of parent compounds and generation of daughter compounds). With the goal of observing the potential for natural attenuation of the chlorinated ethanes and ethenes present at the site, hydrogeologists conducted microcosm experiments to determine both the pathways and rates of contaminant transformation under natural conditions. The results indicated that the microbial population necessary to dechlorinate contaminants was naturally present in the site sediments. With this fact in hand, researchers could now define the degradation pathway. Researches then developed a three-dimensional reactive transport model (RT3D—a multi-species reactive flow and transport simulation computer software) for the site, utilizing the results of the microcosm experiments to develop a site-specific reaction package to simulate the degradation processes. The model was calibrated to current conditions in order to make future predictions. Results indicated that the contaminant plume would stabilize over time and no sensitive receptors (i.e., drinking water aquifer, surface water body, etc.) would be impacted. Consequently, the EPA approved monitored natural attenuation as the selected remedial alternative. Researchers conducted laboratory experiments in an attempt to identify, define, and quantify the microbial population present within the site subsurface (see Bae, et al., 2006; Bowman, et al., 2006). These efforts resulted in the identification of several unique microscopic bacteria, known as 16S rRNA gene sequences, that are closely related to Dehalococcoides ethenogenes. In addition, two new anaerobic bacterial strains were isolated and identified for the first time, and subsequently named after the site. The data demonstrated that a large number of novel bacteria were present in groundwater within the source zone, and the population appeared to contain bacterial components necessary to carry out reductive dechlorination. As noted in the above discussion, the “expert” thought has evolved from a pump-and-treat-solution to monitored natural attenuation as the accepted remedial alternative at this site. 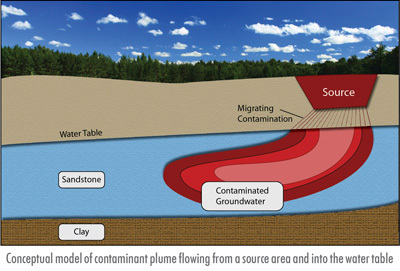 A computer model to simulate the degradation processes was developed for the site to simulate groundwater flow and contaminant transport with a site-specific reaction package. With a better understanding of the degradation processes and bacteria populations providing the driving force, natural attenuation has become an accepted remedial alternative at this site and many contaminated sites throughout the country. Despite increased understanding, scientists have yet to provide a complete and adequate definition of the microbial populations naturally present at all remedial sites. To recap, in order to develop a computer model to simulate groundwater flow and contaminant transport, scientists must come to a proper understanding of the geologic, hydrologic, and biological processes occurring at the site. This understanding is fundamental when the goal is to develop a defensible strategy for monitored natural attenuation for presentation to regulatory agencies. Most importantly, the biologic processes at the Louisiana NPL site have been shown to be active and sufficient for reductive dechlorination of contaminants. But where did these microbial populations come from? Did they evolve to serve this purpose? Impossible, since, in direct contradiction to the evolutionary hypothesis, they would have had to evolve over a short period of time. After all, the contaminants present were not in existence millions of years ago. For example, PCE is a manufactured chemical compound widely used to dry clean fabrics and degrease metals. Michael Faraday first synthesized it in 1821 by heating hexachloroethane until it decomposed into PCE and chlorine. Since evolution cannot account for their presence, where did these microbes come from? For creationists, the answer is simple and obvious. God created these bacteria. Humans did not create this built-in method of breaking down and neutralizing the artificial/synthetic toxic chemicals introduced by humans into the environment. All the efforts of feeble man to decontaminate the hazardous waste site were secondary, perhaps even superfluous, to the naturally occurring attenuation processes already present in the environment. The only logical explanation is that the Creator of the Earth deliberately embedded restorative properties in the environment in order for it to sustain itself for the Creator’s purpose. Essentially, all we “educated” humans can do is observe, monitor, document, and assign sophisticated jargon to what nature does automatically. God created His earthly creation to be self-sustaining, restorative, and resilient. In the beginning, God created the Earth to be inhabited by man, and for man to rule the Earth and its resources (Genesis 1:26-30; Psalm 8:6-8). In addition, God placed within the dynamics of the Earth the processes by which He sustains it. The microbial populations that we scientists are just now identifying, and whose purpose we are just now beginning to understand, were created by God to sustain His creation. It is certainly true that man has made mistakes that have been detrimental to God’s Earth. However, it is also true that God is in control, and no matter what humans do—accidentally or purposefully—that may be harmful to the environment, God will sustain this Earth until it has served His purpose! “By faith we understand that the worlds were framed by the word of God, so that the things which are seen were not made of things which are visible” (Hebrews 11:3). Bae, H.S., Moe, W.M., Yan, J., Tiago, I., da Dosta, M.S., and Rainey, F.A. (2006), “Brooklawnia Cerclae Gen. Nov., Sp. Nov., A Propionate-Forming Bacterium Isolated From Chlorosolvent-Contaminated Groundwater,” International Journal of Systematic and Evolutionary Microbiology, 56:1977-1983. Bowman, K.S., Moe, W.M, Rash, B.A., Bae, H.S., and Rainey, R.A. (2006), “Bacterial Diversity of an Acidic Louisiana Groundwater Contaminated by Dense Nonaqueous-Phase Liquid Containing Chloroethanes and Other Solvents,” FEMS Microbiology and Ecology, 58:120-133, Blackwell Publishing Ltd.
U.S. EPA (1999), “Use of Monitored Natural Attenuation at Superfund, RCRA Corrective Action, and Underground Storage Tank Sites.” United States Environmental Protection Agency, Office of Solid Waste and Emergency Response, Directive Number 9200 (Washington, D.C.: OSWER).